The Official 2018 South Asian Heritage Month Poster is out!! Congratulations to all of our features for being nominated as leaders in Civic Engagement! The poster features Farrah Khan, Jeewan Chanicka, Neethan Shan, Nelofer Pazira, Ritu Bhasin, Shalini Konanur, Dr. Shafi Bhuiyan, and Vivek Shraya. The celebration of South Asian Heritage Month in the entirety of May was of huge importance to The Council of Agencies Serving South Asians. 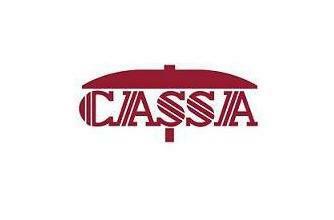 In commemoration, CASSA successfully hosted two receptions. 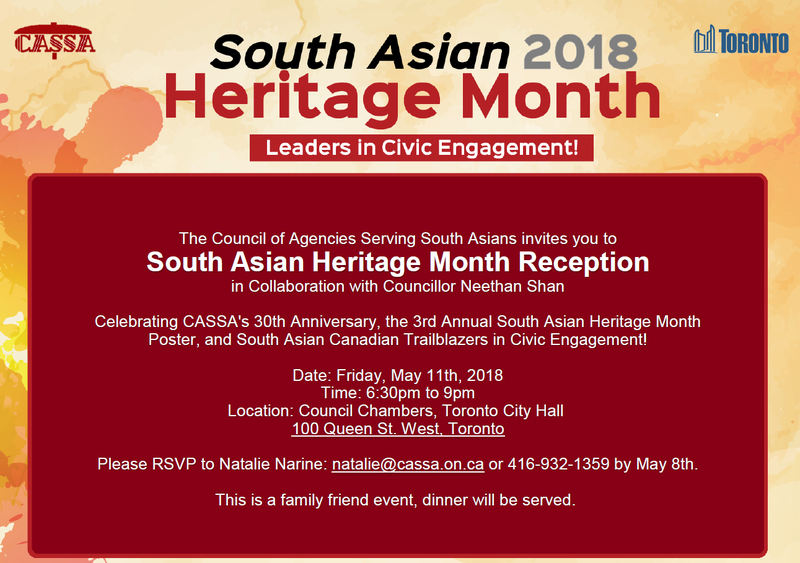 The Council of Agencies Serving South Asians (CASSA) successfully hosted its first ever South Asian Heritage Month Lunch Reception on Friday, April 22nd at Markham Convergence Centre. The main objective was to showcase, celebrate and profile six South Asian Canadians who have made significant contributions to the protecting Human Rights and Promoting Equity in Canada. The recognition will be done through the official poster and a presentation. 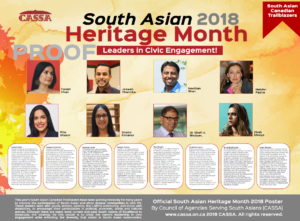 At the event, CASSA was excited to launch its first ever South Asian Heritage Month Official Trailblazers Poster for 2016. 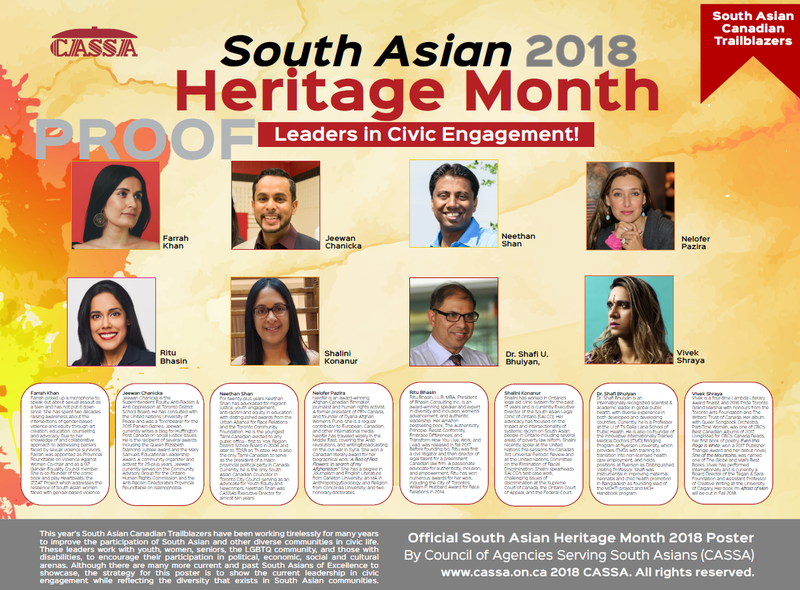 All proceeds from the poster sales will go towards developing CASSA’s initiative – aimed to develop a mobile exhibit showcasing South Asian Histories in Canada. The exhibit will be part of our Canada’s 150th birthday celebrations. The Lunch Reception was attended by elected representatives, numerous social service providers, academics, policy makers, not-for-profit organization members, and frontline workers who are passionate about celebrating accomplishments made by the South Asian Community. Attendees had the opportunity to network, participate in engaging discussions, as well as partake in honouring the six South Asian Canadian Trailblazers who have made significant contributions to the protecting Human Rights and Promoting Equity in Canada. The six trailblazers are: Sherene Razack – Distinguished Professor, OISE, University of Toronto , Ricky Veerappan – Officer in Charge, Diversity, Equity and Inclusion Bureau, York Regional Police, Uzma Shakir – Director of Equity, Diversity & Human Rights, City of Toronto, Baldev Mutta – CEO, Punjabi Community Health Services, Renu Mandhane – Chief Commissioner, Ontario Human Rights Commission and Sheela Basrur – former Medical Officer of Health, City of Toronto. 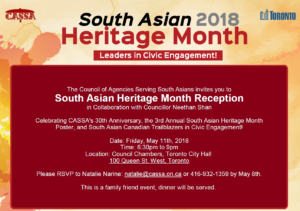 Chinese Canadian National Council Toronto Chapter (CCNC Toronto) to successfully host a reception in commemoration of Asian and South Asian Heritage Month: Celebrating Civic Engagement. The main objective of the reception was to discuss topics such as barriers to civic participation, as well as the factors within our communities that promote our successes. In addition we looked at ways in which we can move forward – the initiatives that the City of Toronto and our own communities can take to increase Civic Involvement. The reception included attendees ranging from students to not for profit workers and City of Toronto staffs. We were also fortunate enough to open the program with greetings from Mayor John Tory who graciously made the attendees feel welcomed and ready to engage in further discussions throughout the night. The reception then proceeded onto a lively panel discussion session where we were joined by the following four panelists: Lele Truong, Parthi Kandavel, Samya Hasan, and Beixi Liu. The panelists along with the moderator Anjum Sultana helped in making the discussions to be extremely thought provoking for our attendees. One of the topics that incited most applause from the 75 guests in attendance was during discussions of “Policy recommendations to increase civic involvement”. Attendees had the opportunity to listen to wide variety of suggestions that ranged from developing culturally specific programming with targeted communications, to effective funding allocation, and having translators on site for major consultation events and cultural programs. The lively discussions coupled with an awards ceremony honoring Mr. Iqbal Ali and Mr. Daniel Yau for their leadership in civic engagement, made for a highly successful, positive, and motivating reception.